The Toa of Light will save Mata Nui! Legends tell of a mysterious and powerful Seventh Toa who will save the island from Makuta… and now he has arrived! 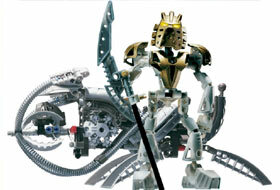 Wearing the Kanohi Avohkii, the Mask of Light, and carrying the Kolhii Staff of Light, he will challenge the darkness of Makuta to free the Matoran. His vehicle, the Ussanui, can speed through the ancient tunnels beneath the island to reach Makuta's lair. The final challenge is about the begin! Push the lever down on Ussanui to make the landing gear come down. Fit the kraata into the Ussanui to help it track down Makuta! Combine this model with #8593 Makuta to build the powerful Takutanuva! LEGO, LEGOLAND, ALPHA TEAM, BELVILLE, BIONICLE, BLOCK-O-DILE, CLIKITS, DUPLO, MINDSTORMS, QUATRO, ROBOTICS INVENTION SYSTEM, the DUPLO logo, the QUATRO logo, the LEGO and LEGOLAND logos are trademarks of the LEGO Group. © 2005 The LEGO Group.